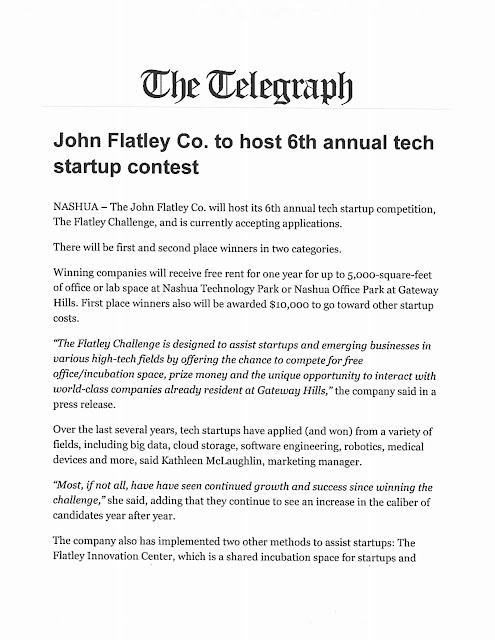 The John Flatley Company is hosting their 6th Annual Flatley Challenge, Tech Startup Competition. The Flatley Challenge is a dynamic competition designed to assist emerging business and startups in the Technology field. Now in its 6th year, The Flatley Challenge has witnessed its past winners grow their startup into large corporations at Gateway Hills, thus exhibiting the potential success from this competition. With each year, brings an increased caliber of candidates from fields of IT, data storage, robotics, communications, medical devices, clean tech, mobile app design, digital health, life sciences and other leading-edge technologies. The competition is intended to stimulate the development and growth of early-age companies by providing them both with incubation space plus the opportunity to interact with world class companies already resident at Gateway Hills such as Dell, Skillsoft, Plexxi, Benchmark Electronics, Amphenol TCS, Arista Networks, Parallel Wireless and more. One of the many benefits of working at the Nashua Technology Park or the Nashua Office Park is the potential to build valuable connections with like-minded entrepreneurs. By surrounding yourself with other passionate innovators and entrepreneurs, you are bound to find motivation and inspiration around every corner. The winner of the Flatley Challenge will receive free rent for one year for up to 5,000SF of office and/or lab space at the Nashua Technology Park (NTP) and/or Nashua Office Park (NOP) at Gateway Hills. Additionally, winner will receive up to $10,000 in fit-up, connectivity and related costs. Deadline for applications is October 31, 2017. Live Free and Start features all New Hampshire Business Funding Opportunities. This list is designed to help you take your idea to the next level by listing competitions that offer a unique opportunity to get in front of investors and prospective customers, partners, and supporters while competing for a chance to win cash and prizes to grow your business. Listed in the Competitive Funding Programs, The Flatley Challenge is a unique opportunity to grow your business, as the winner will receive free rent for one year for up to 5,000 square feet of office and/or lab space at the Nashua Technology Park (NTP) and/or Nashua Office Park (NOP) at Gateway Hills, and up to $10,000 in fit-up, connectivity and related costs. Interested candidates may apply online at http://www.gateway-hills.com/flatley-challenge/. Deadline for applications is October 31, 2017. 6th Annual Flatley Challenge Tech Startup competition was recently featured in the Lowell Sun business briefs. The Lowell Sun explains, the winner(s) of the innovative competition will receive free rent for one year for up to 5,000 square feet of office and/or lab space at the Nashua Technology Park (NTP) and/or Nashua Office Park (NOP) at Gateway Hills, and up to $10,000 in fit-up, connectivity and related costs. Applications should include the executive summary section of the existing business plan or a thorough description of the nature of the venture including, but not limited to the history of the business, its proposed or existing product line, the characteristics of the potential market, the general marketing plan and efforts to date, the organization of your business including your management team, existing and projected financial resources available to the business, the long term business goals and its job growth potential for the next three to five years. The John Flatley Company is hosting their 6th Annual Flatley Challenge, Tech Startup Competition and applications are now open. Interested candidates may apply online at http://www.gateway-hills.com/flatley-challenge/. Deadline for applications is October 31.
Business NH Magazine featured the 6th Annual Flatley Challenge Startup Competition. This article features the benefits of the competition as it ultimatley promotes growth of startup compnies. The winning companies recieve free office/lab space for a year at Gateway Hills and up to $10,000 in fit-up, connectivity and related costs for startup growth. Read more to learn about this dynamic competition for startups and emerging businesses and how to apply at www.gateway-hills.com/flatley-challenge. Deadline for applications is October 31, 2017. The 6th Annual Flatley Challenge Tech Startup Competition featured in the Union Leader. Click to read more about this dynamic competition geared toward assisting growth in emerging startup tech companies and businesses in the fields of IT, communications, data storage, connectivity, robotics, clean tech, medical devices, digital health, mobile app design, life sciences and other leading-edge technologies. Each year, the winner(s) of the innovative competition receive free rent for one year for up to 5,000 square feet of office and/or lab space at the Nashua Technology Park (NTP) and/or Nashua Office Park (NOP) at Gateway Hills, and up to $10,000 in fit-up, connectivity and related costs. The 6th Annual Flatley Challenge was recently featured in two New Hampshire Business Review articles. The 6th Annual Flatley Challenge was recently featured in The Telegraph. Come for a fun day of activities for everyone! The John Flatley Company is hosting their 6th Annual Flatley Challenge, Tech Startup Competition and applications are now open! Interested candidates may apply online at http://www.gateway-hills.com/flatley-challenge/. Deadline for applications is October 31, 2017. Any questions about the Flatley Challenge should be directed to Kathleen McLaughlin, Marketing Manager for the John Flatley Company at (603) 598-7500 or via email at kathleen.mclaughlin@nulljohnflatleyco.com.